Onion is a member of the Allium genus, which also includes shallots, chives, garlic, and leeks. “Onion” is from the Latin words “one,” “oneness,” and “unity.” Roman farmers used the word “onion” because onions grew without forming multiple bulbs as opposed to garlic and shallots.. Onions have been cultivated since their discovery in northern Asia and Palestine more than 5,000 years ago. The ancient Greeks believed there were therapeutic effects in eating onions. From the end of the Middle Ages, onion became a typical part of European diet. Today, onions are ubiquitous throughout the world. Like many in the same family, onions are grown for their characteristic underground bulbs which consists of swollen leaf bases that store energy for the next growing season. These energy stores are accumulated as fructose sugars rather than long-chains of glucose (starch), as with other plants. All members of the Allium family have distinctive tastes due to their specific volatile oils containing sulfur. This sulfur-like flavor is a natural defense that deters animals from eating onion plants. The plant takes up sulfur from the soil in which it grows and converts it into a form held in storage. When the onion's cells are disrupted (e.g. by chewing or chopping), allinase enzymes stored in one part of the cell reacts with the stored sulfur-containing molecule to release the irritating pungency. The released molecules further react with oxygen and further decompose with time to generate additional distinctive flavors. Cooking transforms the the pungency to a sweetness and savory flavor that makes onions an integral ingredient in many dishes throughout the world. Until hybridizing technology arose in 1920s creates sweet onions that could grow in cool climates, the onions familiar to most Americans were the sharp flavor varieties brought by the early colonists to the Northeast. 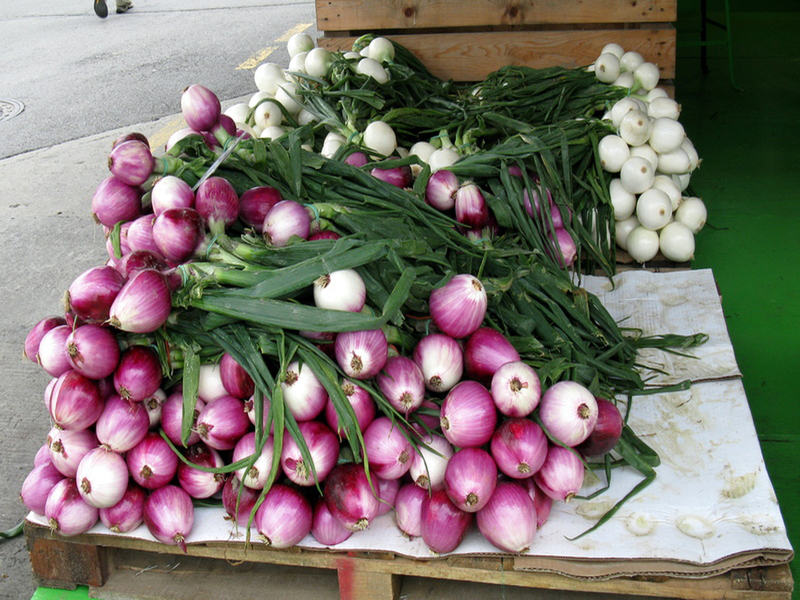 Sweet onions are generally sold fresh and stored only short-term, while spicer onions have less juice, longer shelf-life, and often are cured as storage onions. Today, common storage onions in the U.S. include the spicy yellow, the large Red Bull, and the red zeppelin. During the winter, Inca sweets from Peru, and Mayan sweets are sold fresh in the U.S. Onions that are best eaten raw: Maui onions grown on the Haleakala volcano, the Siskiyou onions from the Pacific Northwest, and the intensely sweet Walla Wallas which can be eaten like an apple. Other sweet onions: Vidalia, White granex, Texas sweets. Onions with the most pungency and heat include small spicy turbos, baby red Creoles, red zeppelins, and Australian browns. Onions good for roasting: Cippolline onions are a flat Italian variety that turn buttery when roasted. Onions good for boiling: Pearl onions. Onions good for pickling: Pearl onions and torpedo onions. Onions good for sauces: French shallots with their spiciness. Onions for for vinaigrettes: French gray shallots with their creamy texture. Onions famed for grilling: torpedo onion and Italian Tropea lunga. Onions ideal for carmelizing: the supersweet candy hybrid. Onions bred for use in a sandwich: red burgermeisters and the giant red hamburger. Onions planted in the fall are harvested young in late spring with their green stems and are perishable so should be eaten within days. Over the summer, varieties with thin skin allow for longer shelf-life, but high water content still dictates that they should be eaten quickly. In the late summer low moisture varieties are placed in dry storage until their skins turn hard, which traps the juices inside. These so-called storage onions can be held in a cool and dry place and may last up to 8 months. The spicy yellow storage onion is the workhorse of the kitchen; the Red zeppelin is another popular storage hybrid; and late-season Copras are large and juicy storage onions. When eating raw chopped onions, their pungency may be lessened by rinsing since the sulfur compounds are released at their surface and also become more potent with time and exposure to air. Yellow onions owe their color to polyphenol flavonoids, while red onions have anthocyanins, but only in the surface of each leaf. Both red and yellow onions contains the flavonoid quercetin. The volatile chemical released by raw, cut onions that stings the eyes is propanethial S-oxide a so-called “lacrimator” which binds to nerve endings in the cornea and nose and breaks down into hydrogen sulfide, sulfur dioxide, and sulfuric acid. The tearing effect of onions can be lessened by placing them in a freezer for 10 minutes or in a refrigerator for 1 hour before peeling or chopping. Cooling onions also hydrates the their skin, making the skin less brittle and easier to peel. Additionally, retaining the root ends of onions also helps minimize the release of eye irritants. Onions should be kept covered once peeled as they oxidize quickly and become more pungent. Red and yellow onions contain high amounts of the flavonoid quercetin. White onions on the other hand only contain trace levels. Quercetin inhibits enzymes such as MMP-2 and MMP-9 secreted from tumor cells that allow of invasion and metastases, and also inhibits endothelial blood vessel cells from proliferating, migrating, and forming tubes. Case control studies in Italy and Switzerland have demonstrated that moderate to high consumption of onions reduce cancer risk. A moderate frequency of 1-7 servings/week to a high frequency of 7 servings/week reduce risk of colorectal, and prostate, ovarian, and esophageal cancers. There was a 73% risk reduction for ovarian cancer and an 88% risk reduction for esophageal cancer in those who consumed more than 7 servings/week than for those who consumed less than 1 serving/week. Additionally, in an separate Dutch study, eating at least half an onion per day was associated with a 50% risk reduction for gastric cancer. The large-scale EPIC study demonstrated that higher consumption of onions was associated with a 21% risk reduction for ovarian cancer. Microwaving onions generates trisulfides, which are responsible for the characteristic flavor of overcooked cabbage. The cooking method, temperature, and medium all affect the flavor of onions. During slow, low-heat sauteeing carmelization occurs due to sugar chains breaking down into simpler structures, and onion carbohydrates and proteins interacting to create a brown, meaty, umami-like quality (the so-called "Maillard reaction"). Butter is the ideal medium for this process because of its own proteins, which facilitate the reaction. Vidalias and Mauis do not really refer to specific cultivars but rather sweet onion varieties that are grown in different soil conditions of low-sulfur. The tiny Pearl onion is not a small variety but rather some from plants sowed at dense patches so they have no room to grow large. Sweet onions do not generally have more sugar but rather fewer of the sulfuric compounds that make other varieties sharp and pungent. Red onions contain 4x more antiangiogenic quercetin as white onions. Baking or sauteing onions are better than boiling to preserve quercetin levels.